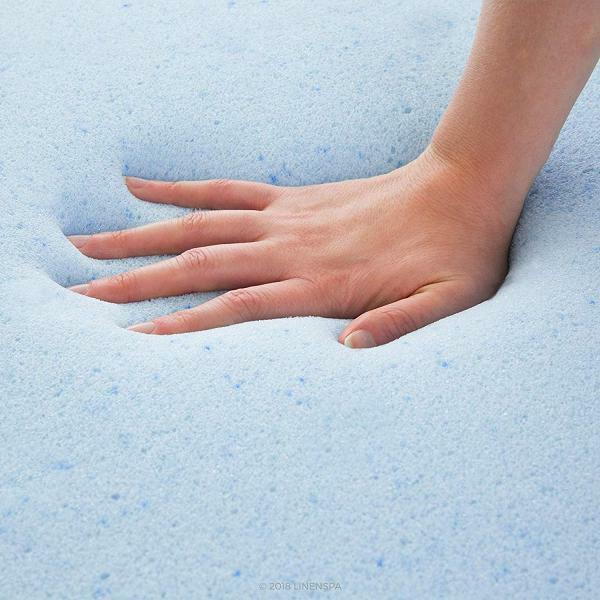 12 Must Have Products to Make Your Bed the Most Comfortable Place in Your Home. If your bed is your throne or your command center, these products are sure to make it a lot more comfortable and organized. 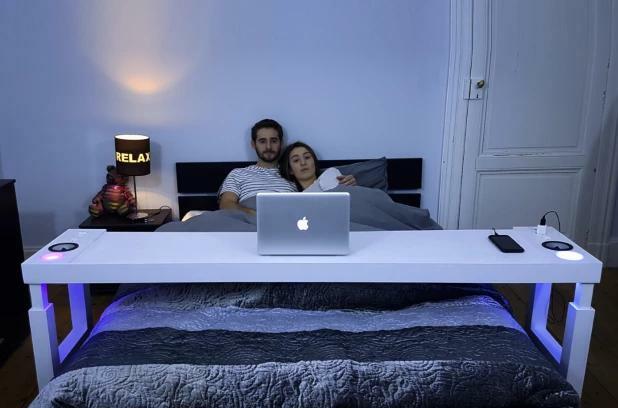 Bedchill: Bedchill is an overbed table that’s designed to take your bed to the next level. This multi-functional overbed table turns your bed into a second living room and office. 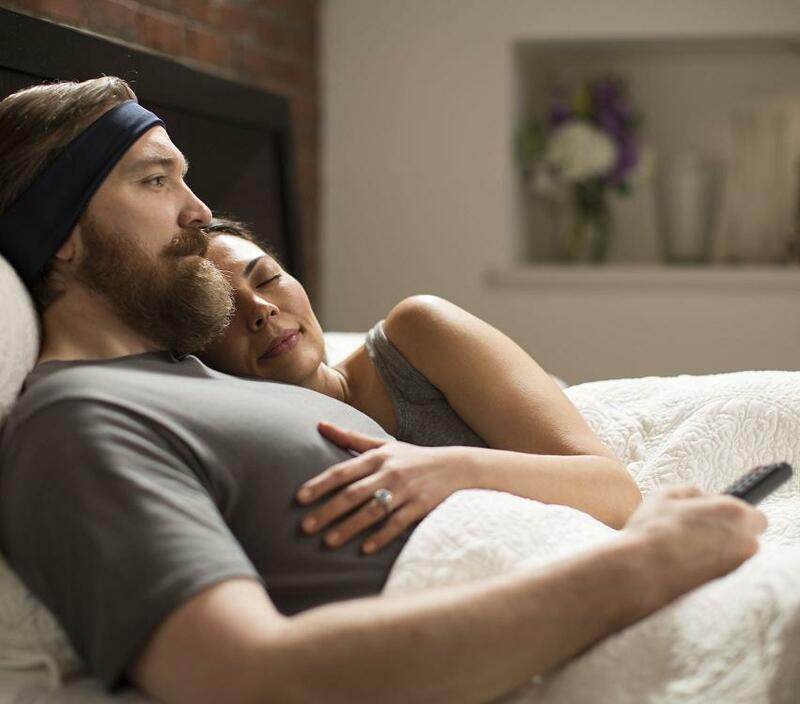 You can eat, use your laptop, binge-watch, work, play, read, listen to music and more, right in your bed. It transforms your bed into an ultimate oasis of entertainment, dining, storage, and workstation. It features 4 power outlets, stereo speakers, 4 USB recharging ports, lighting, remote control, 2 drawers and retractable electric cable. It also features 3 raised edges so things don’t fall off, and 4 casters to make it glide easily back and forth. 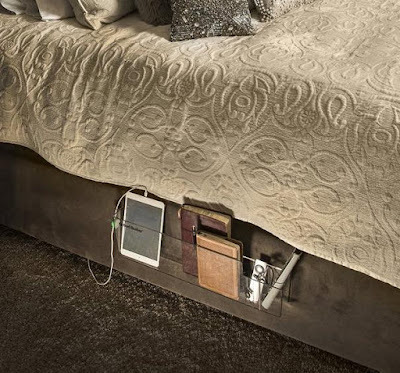 Bed Butler Bedside Caddy: The Bed Butler Bedside Caddy holds laptops up to 17″, magazines, smart devices, books, smart phones, remotes, pens, glasses and more, all within reach while one rests in the bed. Adjustable Laptop Stand: If you are among those who don’t want to get out off the bed but have work to do, then this awesome Adjustable Laptop Stand is a must for you. It lets you do your work while you lay in the comfort of your bed. 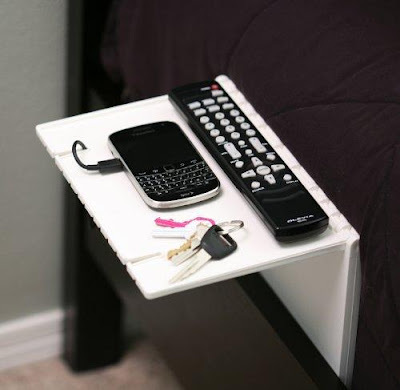 Urban Shelf: The Urban Shelf is a space saving bedside storage system for smart phones, smart devices and other essentials; it folds flat to only 1/2″ thick. 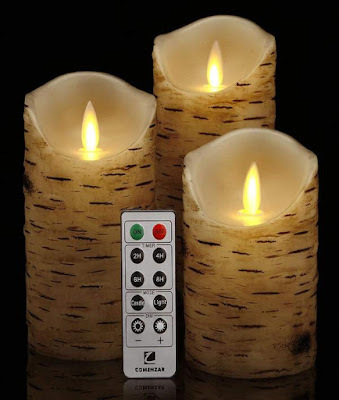 Flickering Candles: These birch candles are just the thing you need to set the mood in your bedroom. You can place these real wax pillar candles around your bed and need not worry, as these are flameless and safe. You can set them up on auto timer of 2, 4, 6, or 8 hours, these run on AAA and provides about 150 hours of continuous ambience. 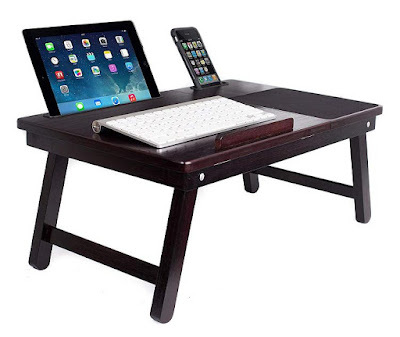 Multi Tasking Laptop Bed Tray and Table: The Multi Tasking Laptop Bed Tray and Table can accommodates laptop computers up to 18″, smart devices 9.6 inches or smaller and smart phones 3.5″ or smaller. 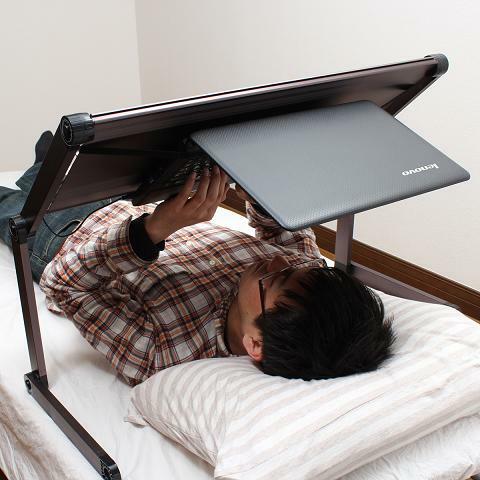 It’s your perfect lapdesk for work, games, reading, eating and more, all from the comfort of your bed. It features integrated storage drawer and comes with foldable legs for easy storage. TellyPhones: TellyPhones let you to comfortably listen to TV programs wirelessly (Bluetooth) from bed without interrupting your partner’s sleep. 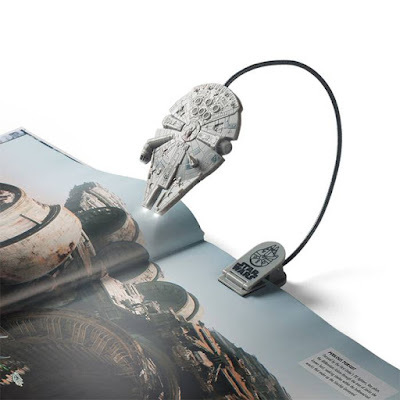 Millennium Falcon Book Light: The Millennium Falcon from the Starwars Galaxy that took Captain Han Solo and Chewy to numerous fabulous adventures is now here as a book light for you. It’s an adjustable clip-on book light that features 3 white lights where the C-Beam Lamps are and on the front of the cockpit. It comes with an automatic shut off to save power after 30 minutes of no usage. Prism Glasses: These glasses transform your view to a 90° downward angle; that lets reading a book or watching TV while lying down comfortable. Roome: Roome is a gesture-control lamp that lights up automatically when you enter the room and when it detects no activity in the area, it turns itself off to save energy. When your afternoon reading session turns into a well deserved nap, it lets you rest by silently turning off when not needed. 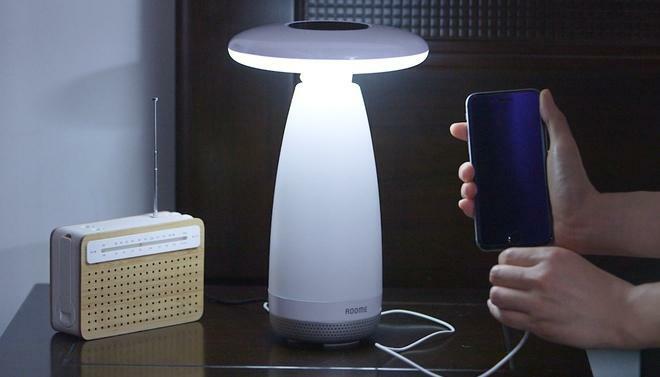 With a simple pass of the hand over Roome, it turns on or off silently. It automatically turns on when it senses the dark, and also senses when ambient light is sufficient and can turn itself off to save power. You can even set it to detect a loud noise and automatically turn on. It also comes with dual USB ports for fast, efficient 5V-1A device powering or recharging. Its app lets you to program features, adjust settings and control Roome with your smartphone. It’s compatible with Android and iOS. 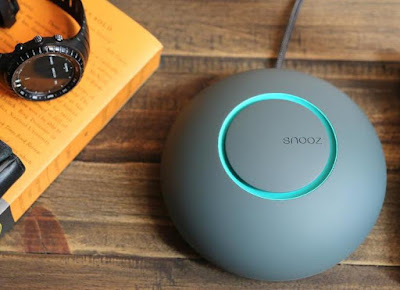 Snooz: Snooz is an ultra-portable sound conditioner that lets you tune out the world with the soothing sound of moving air. This acoustic white noise machine makes it easy for you to fall and stay asleep. You can adjust the volume and tone on the device or use its app for the same.